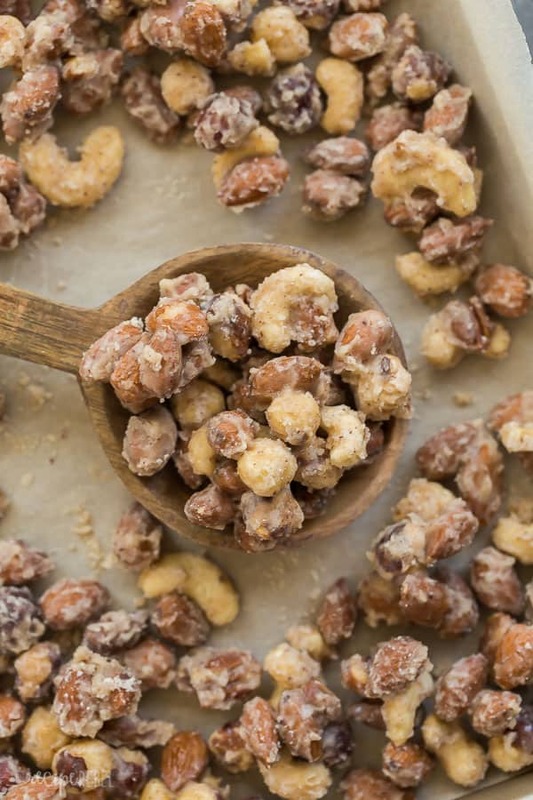 These Easy Candied Nuts are just 6 ingredients and less than 30 minutes start to finish! They are sweet and salty with a hint of cinnamon — perfect for an edible holiday gift! I will admit, the last few years I haven’t really done a whole whack of Christmas baking and candy making and homemade gifts because, well, kids are crazy. This year, we have a 1 year old, 3-almost 4 year old, and a 6 year old, and it’s busy. And I don’t like busy (you can ask anybody) — I’m an introvert big time and when I don’t have enough time to recuperate and refill, I start to feel a little crazy myself. And so, I let go of the expectations that I will spend hours and hours baking and prepping and making edible gifts with cute labels for every person we see ever, and I don’t make homemade Christmas cards and I give myself a little leeway. But I so badly want to make space for good, homemade treats, so for me this year is all about finding those easy recipes that are just as fun and delicious as the sugar cookies you have to spend 18 hours chilling and rolling and cutting and baking. 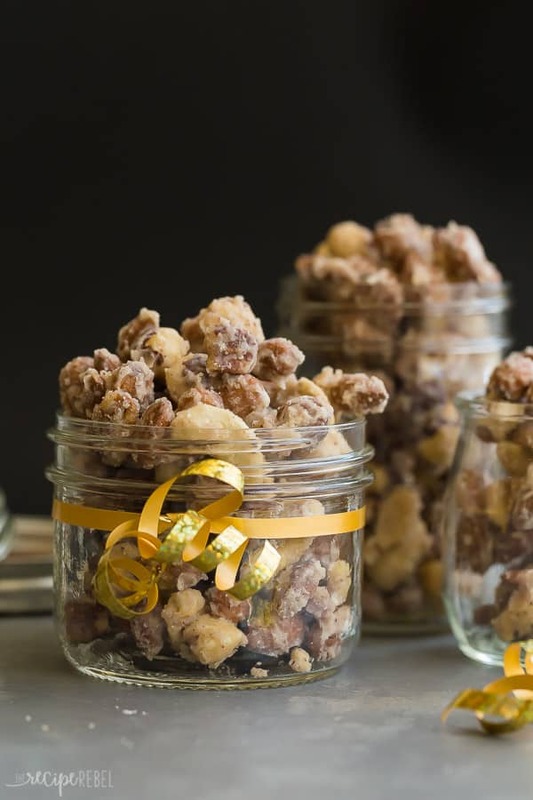 All that to say these Candied Nuts are on that list. They are easy (really), with just 6 ingredients and super customizable. They look cute in a small glass jar with a simple ribbon, which means minimal wrapping for you. They are perfect for snacking or an appetizer or dessert, or even to top a salad. 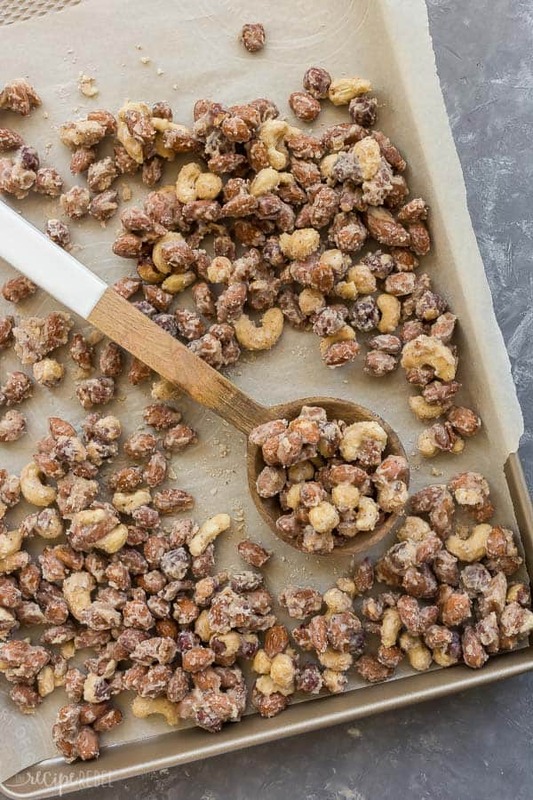 Making these Candied Nuts is relatively easy, as long as you have a thermometer. There are other methods but using a thermometer to check if the candy is ready by far the easiest. Your best bet is to get a clip on candy thermometer like this one. Then you’re on your way to perfect candy coating! Simply simmer the sugar and milk (I haven’t tried this recipe with non-dairy milk, so I can’t advise on that), until it reaches the correct temperature, stir in the flavorings (cinnamon, vanilla and salt – but you could mix this up if you wanted! ), then stir in your nuts. 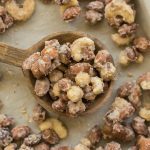 Feel free to mix up the nuts to suit your tastes — our favorite are almonds, cashews, walnuts, pecans and peanuts. You can store these at room temperature in an air tight container (I love to keep them in mason jars as they look so pretty!) for up to 1 week. To freeze, place in a large freezer bag and freeze for up to 3 months. Eat them right out of the freezer or allow to thaw for 10-15 minutes on the counter. 1/4 teaspoon of salt will give it just the slightest hint of salt, 1/2 teaspoon will give it a more pronounced sweet/salty flavor. Add in a pinch of cayenne for a bit of spice! Use only your favorite nuts — there’s no reason you need to use a mix! If you love almonds, use just almonds, or pecans, or walnuts, etc. Add more cinnamon, and a pinch of ginger, cloves and nutmeg for a fall spice blend — just start with a teeny tiny amount so you don’t overdo it! In a medium pan over medium heat, whisk together the sugar and milk and heat until boiling. Without stirring (resist the urge to touch it! ), let the mixture boil on medium heat until it reaches 242-248 degrees F or firm ball stage on a candy thermometer. This took about 10 minutes for me. You can also test it by dropping a small amount into a glass of very cold water — if it forms a firm but pliable ball, it’s ready. Stir in cinnamon, vanilla and salt. Add nuts and stir until coated. Spread onto a parchment lined baking sheet and separate or let harden in large chunks — whatever you prefer. Let cool until candy coating is firm, then store in an air tight container for up to 1 week at room temperature, or freeze for up to 3 months. Recipe adapted from Company’s Coming.